Winton Hydraulic Offset Flail Mowers. 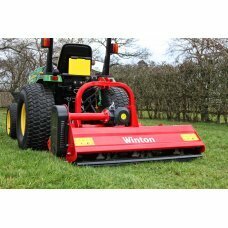 Ideal for Smallholdings & Sports Fields. The heavy hammer blades are perfect for cutting the tough longer grass in pasture and paddock areas and then leaving a finer cut shorter grass on lawns. Gives a Lawn Quality Finish. Hydraulic offset A-frame as standard. Upgraded bearings for smoother action. Spirally arranged blades for an efficient cut.